There are several important aspects to research methodology. This is a summary of the key concepts in scientific research and an attempt to erase some common misconceptions in science. 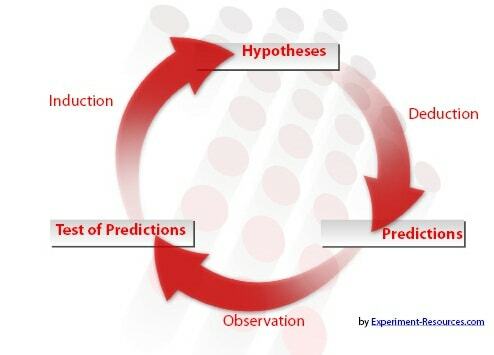 Steps of the scientific method are shaped like an hourglass - starting from general questions, narrowing down to focus on one specific aspect, and designing research where we can observe and analyze this aspect. At last, we conclude and generalize to the real world. Researchers organize their research by formulating and defining a research problem. This helps them focus the research process so that they can draw conclusions reflecting the real world in the best possible way. In research, a hypothesis is a suggested explanation of a phenomenon. A null hypothesis is a hypothesis which a researcher tries to disprove. Normally, the null hypothesis represents the current view/explanation of an aspect of the world that the researcher wants to challenge. Research methodology involves the researcher providing an alternative hypothesis, a research hypothesis, as an alternate way to explain the phenomenon. The researcher tests the hypothesis to disprove the null hypothesis, not because he/she loves the research hypothesis, but because it would mean coming closer to finding an answer to a specific problem. The research hypothesis is often based on observations that evoke suspicion that the null hypothesis is not always correct. In the Stanley Milgram Experiment, the null hypothesis was that the personality determined whether a person would hurt another person, while the research hypothesis was that the role, instructions and orders were much more important in determining whether people would hurt others. A variable is something that changes. It changes according to different factors. Some variables change easily, like the stock-exchange value, while other variables are almost constant, like the name of someone. Researchers are often seeking to measure variables. The variable can be a number, a name, or anything where the value can change. An example of a variable is temperature. The temperature varies according to other variable and factors. You can measure different temperature inside and outside. If it is a sunny day, chances are that the temperature will be higher than if it's cloudy. Another thing that can make the temperature change is whether something has been done to manipulate the temperature, like lighting a fire in the chimney. In research, you typically define variables according to what you're measuring. The independent variable is the variable which the researcher would like to measure (the cause), while the dependent variable is the effect (or assumed effect), dependent on the independent variable. These variables are often stated in experimental research, in a hypothesis, e.g. "what is the effect of personality on helping behavior?" In explorative research methodology, e.g. in some qualitative research, the independent and the dependent variables might not be identified beforehand. They might not be stated because the researcher does not have a clear idea yet on what is really going on. 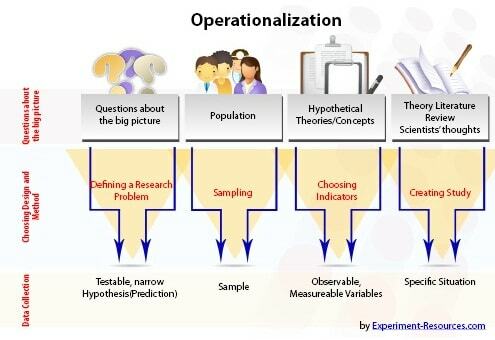 Operationalization is to take a fuzzy concept (conceptual variables), such as 'helping behavior', and try to measure it by specific observations, e.g. how likely are people to help a stranger with problems. To test a hypothesis, quantitative research uses significance tests to determine which hypothesis is right. The significance test can show whether the null hypothesis is more likely correct than the research hypothesis. Research methodology in a number of areas like social sciences depends heavily on significance tests. A significance test may even drive the research process in a whole new direction, based on the findings. The t-test (also called the Student's T-Test) is one of many statistical significance tests, which compares two supposedly equal sets of data to see if they really are alike or not. The t-test helps the researcher conclude whether a hypothesis is supported or not. Drawing a conclusion is based on several factors of the research process, not just because the researcher got the expected result. It has to be based on the validity and reliability of the measurement, how good the measurement was to reflect the real world and what more could have affected the results. The observations are often referred to as 'empirical evidence' and the logic/thinking leads to the conclusions. Anyone should be able to check the observation and logic, to see if they also reach the same conclusions. Errors of the observations may stem from measurement-problems, misinterpretations, unlikely random events etc. A common error is to think that correlation implies a causal relationship. This is not necessarily true. 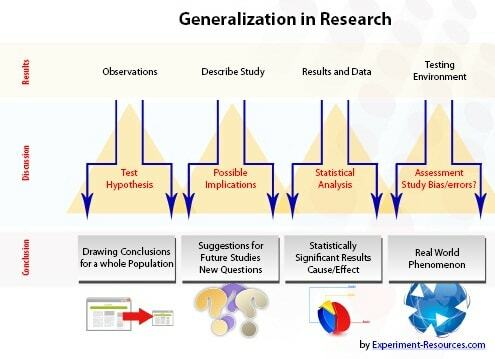 Generalization is to which extent the research and the conclusions of the research apply to the real world. It is not always so that good research will reflect the real world, since we can only measure a small portion of the population at a time. A definition of reliability may be "Yielding the same or compatible results in different clinical experiments or statistical trials" (the free dictionary). Research methodology lacking reliability cannot be trusted. Replication studies are a way to test reliability. Both validity and reliability are important aspects of the research methodology to get better explanations of the world. Type 1 error is when we accept the research hypothesis when the null hypothesis is in fact correct. Type 2 error is when we reject the research hypothesis even if the null hypothesis is wrong.